G1 Gaming reloaded. 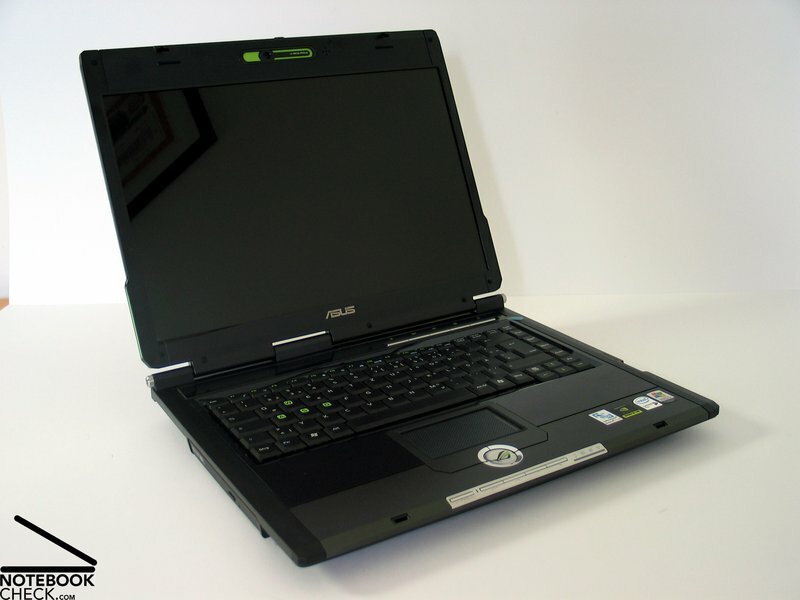 The Asus G1 series, the 15 inch gaming notebooks, are offered as G1S, further improved and updated with new technology. An Intel T7500 CPU and a Geforce 8600M GT video card make it fit for current DirectX 10 games, and, furthermore, impress by an outstanding performance increase. 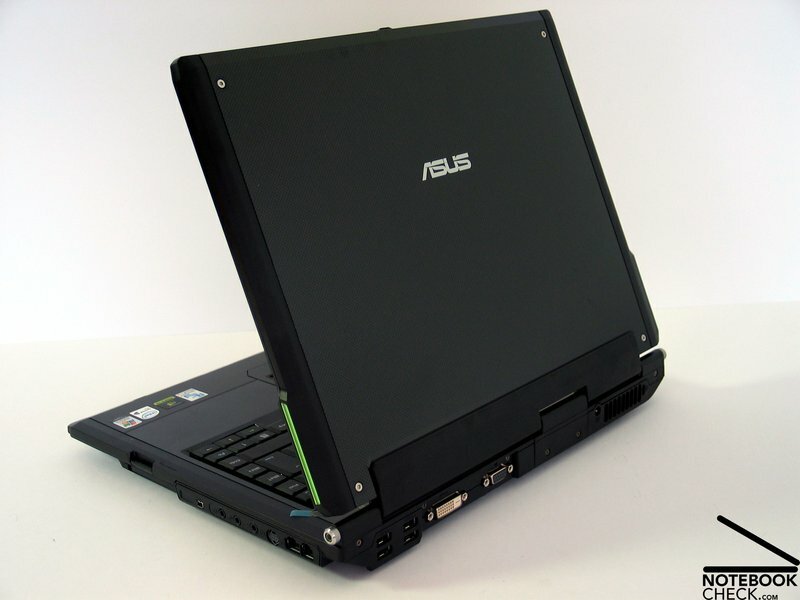 Besides the ports at its backside the G1S' case is alike the one of the already reviewed Asus G1. Therefore, the aspects case and layout are identical. 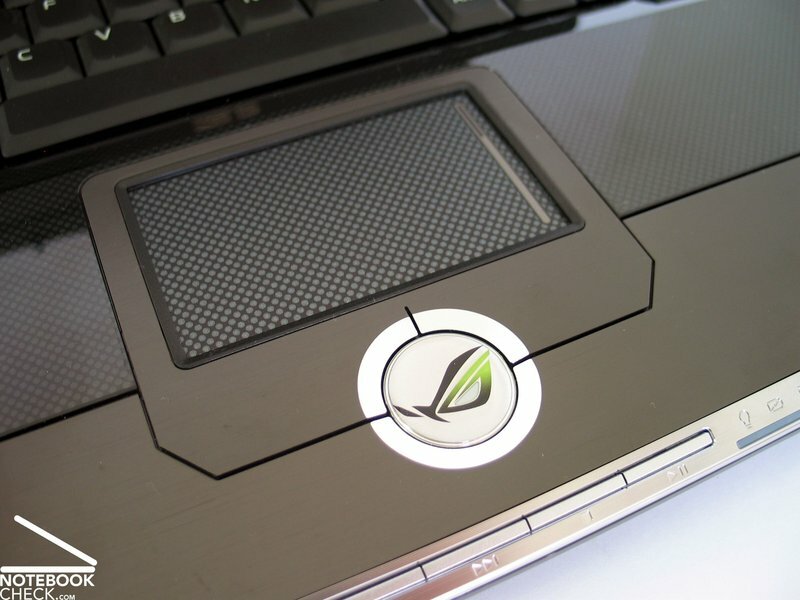 The design of the Asus G1 is very similar to that of the Asus G2P, which is the 17 inch version of the gaming series. Because the colored inlays left and right of the keyboard were omitted, it is not that ostentatious and coltish than the G2P. However, the G1 does not completely miss color out. 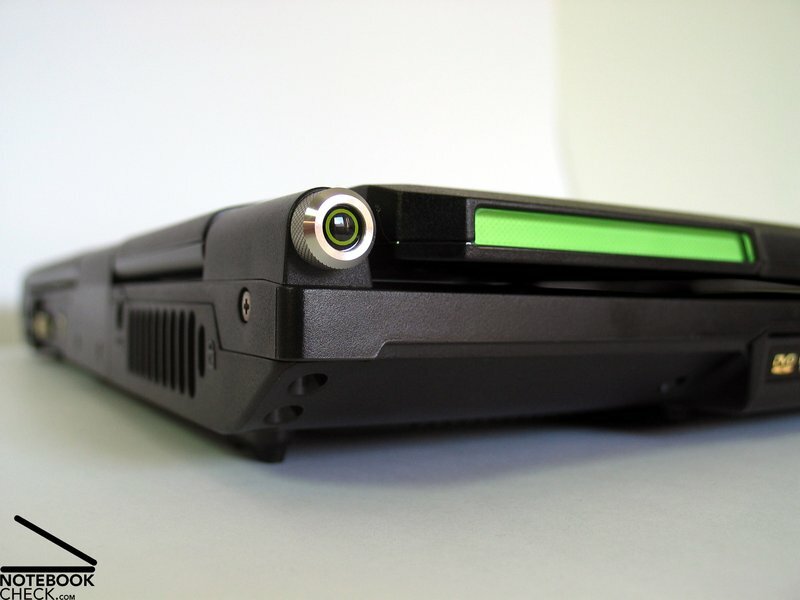 The selected identification color of the G1 is green, more precisely a really bright green. 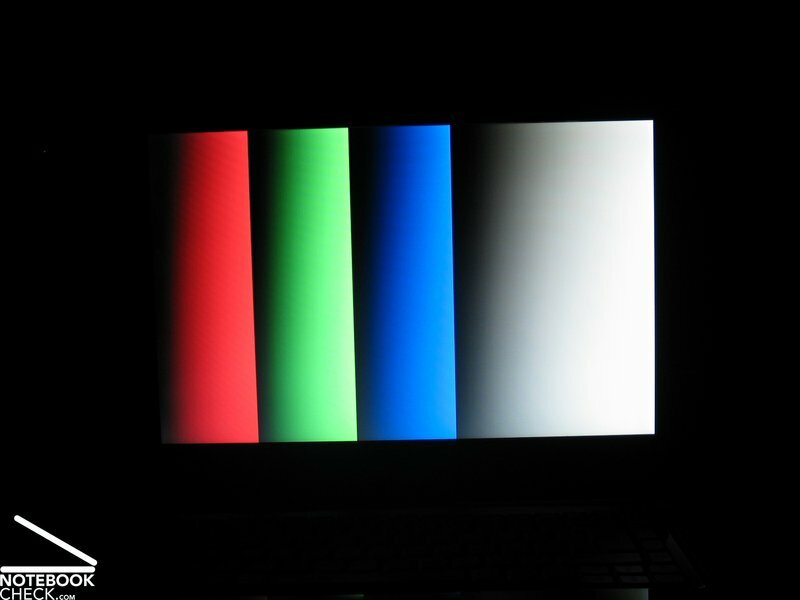 This color is partly used for the keys, but also the web cam and the flashing lights at the edge of the display are colored green. According to the advertising, these flashing lights should boost the playing user (they are coupled to activation of DX9). We can confirm this. 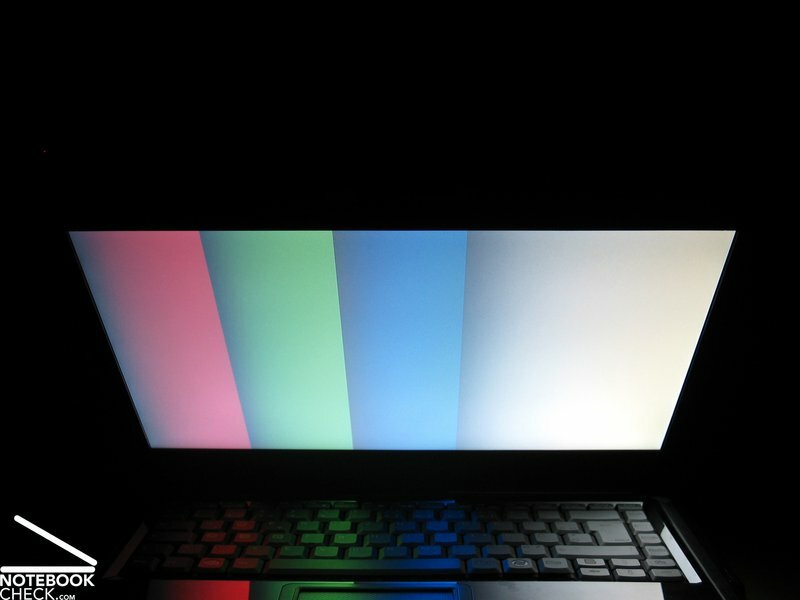 Our aggressions actually increased by the flashing, but we doubt that this is helpful for playing games. A small, but useful display above the keyboard provides you with some interesting information like e.g., the current time. Be that as it may. The workmanship of the Asus G1 is alright. The case is very flexural rigid and resistant against applied forces. However, applying very strong forces might lead to slightly creaking noises, but you'll hardly hear any during regular operation. The outside of the case is mainly out of plastics. It is used with matt appearance and slightly sand blasted surfaces as well as with reflecting and partly transparent appearance for the display cover and the hand ball support. Furthermore, metal is used at some spots, e.g. 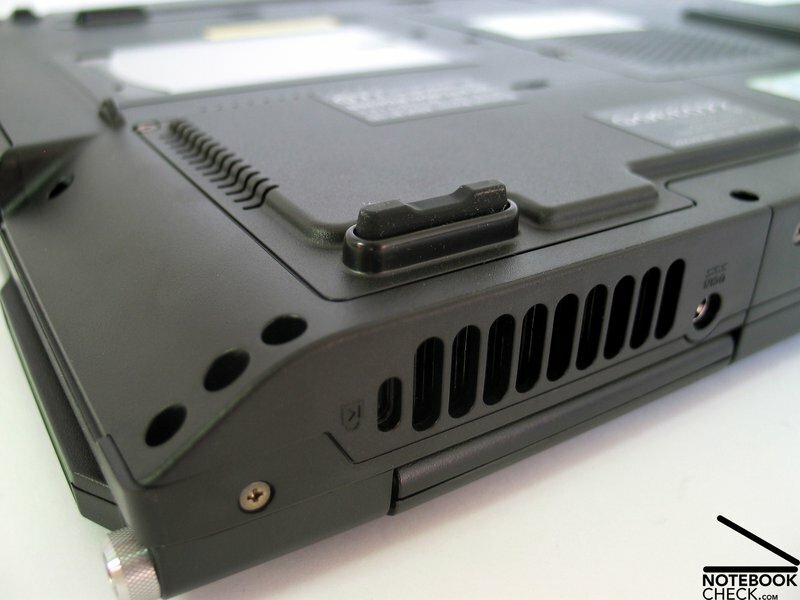 some screws and at a molding at the front region and at the touch pad (aluminum) . The least stable, but yet sufficiently stable part of the G1 is the display cover. 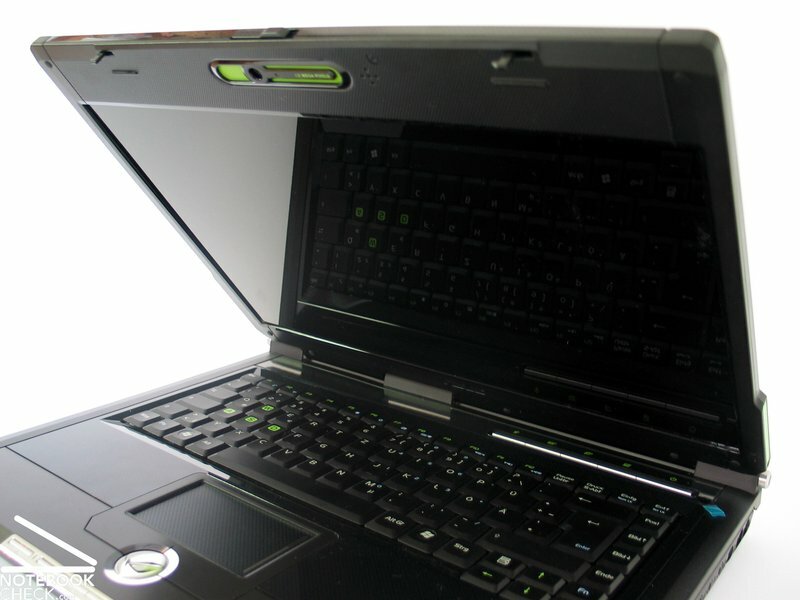 Especially in the center of the back, the display cover can be deflected by only applying moderate force. This hints on that only the outer hinges are actually for holding the display, whilst the one in the center is presumably only used for providing the electronic contacts. The display can be positioned by applying a comfortable amount of force, and slightly see-saws after adapting the position. Even if closed, the display, which is locked by two hooks, possibly slightly wobbles. 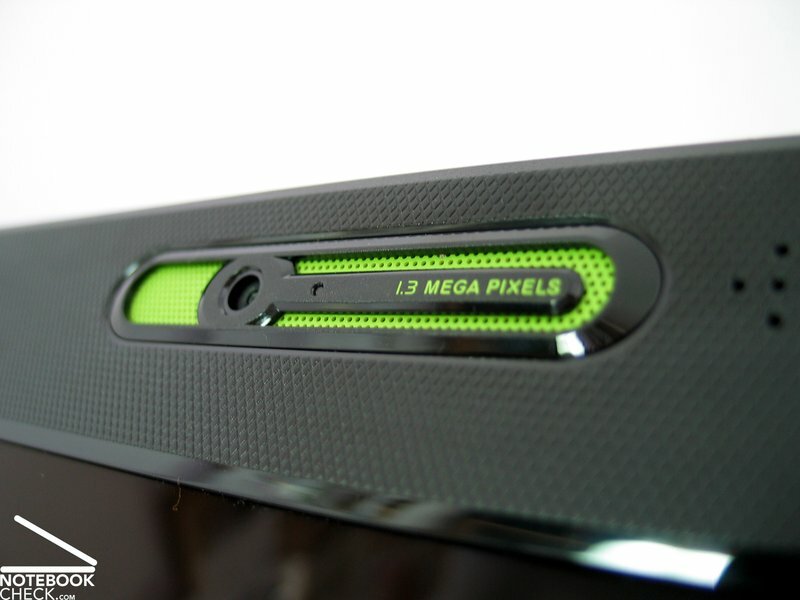 Because the case gets slimmer at the side edges and and at the front edge, most of the ports are placed at the back side and at the right side near the back. The number and kind of provided ports is passable. Instead of a DVI port which is provided by the G1, the G1S now provides an HDMI port, which can be used as DVI port by means of an adapter. Additionally an external S-ATA interface is available. 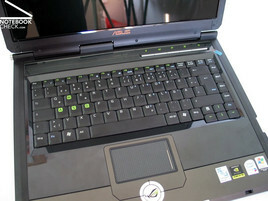 The keyboard of the Asus G1 considerably differs from the G2P's. 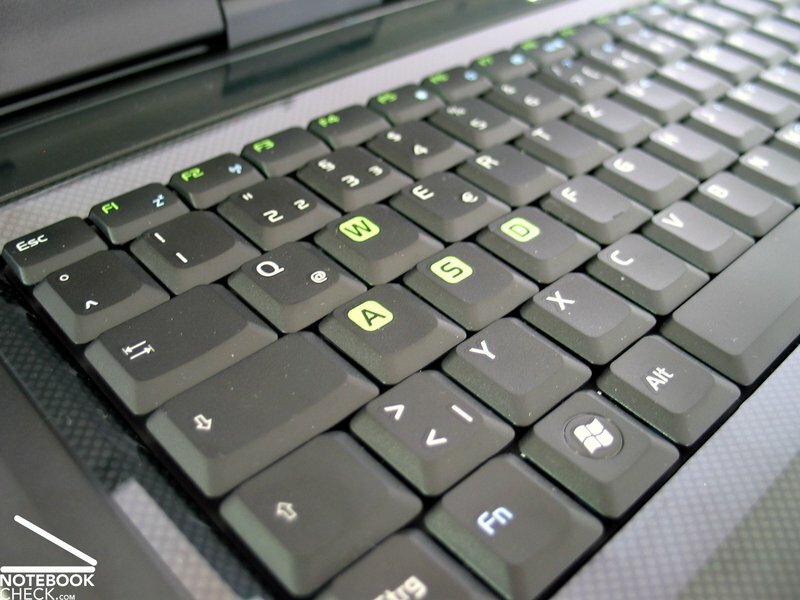 E.g., its enter key extends over two rows and it provides a second FN key at the right. In turn, the left shift key is a little smaller. The A-W-S-D keys have again big, colored imprinted digits, but in the contrary to the G2P, the imprint is green. 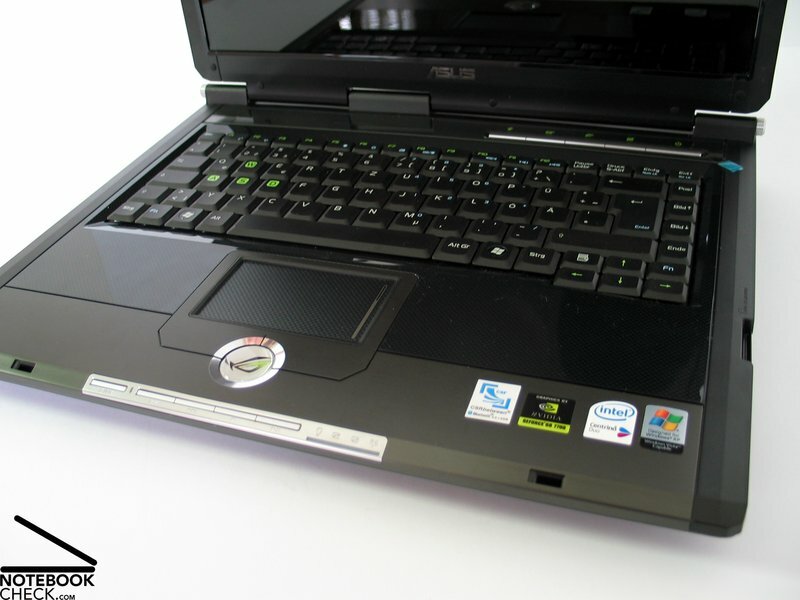 Striking and in similar form also provided by some other new competitor notebooks: a Windows key with round and gleaming Vista-Logo. This notebook provides even two of them. Even if it is convenient, we feel that it is a shame that a dominating operating system also influences the design of case components. Nothing objects to the keyboard in use. The whole unit is tightly attached to the case. However, its layout is understandably rather dense. Even fast typing did not uncover any weaknesses, you can only hear a slight clicking noise. Typing itself also feels comfortable. The touch pad has a surface, which is similar to those of the display cover and the hand ball support. Still, its sliding properties rate good up to very good. Regarding response and precisions we could not detect any anomalies. 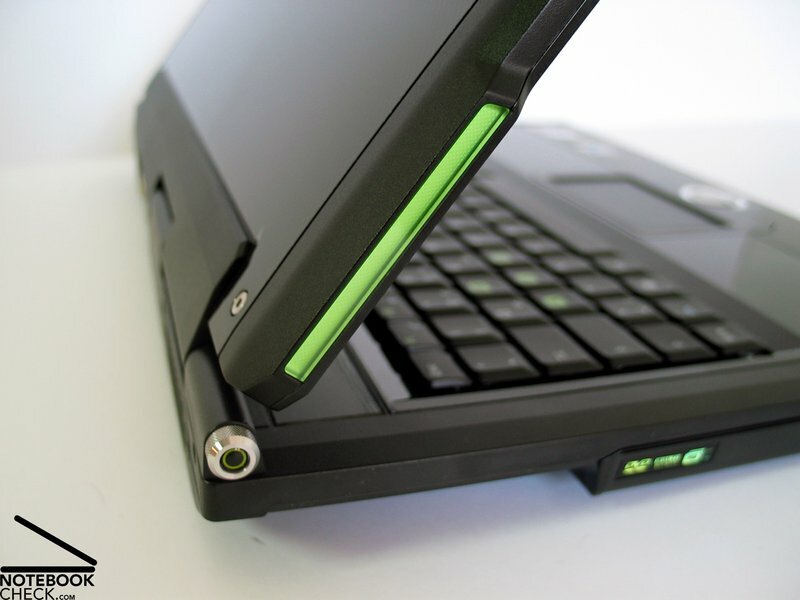 The pad is edged by an aluminum part, which also contains both of the touch pad's buttons. Despite the challenging choice of material, they can be used in their whole extend without any problems. 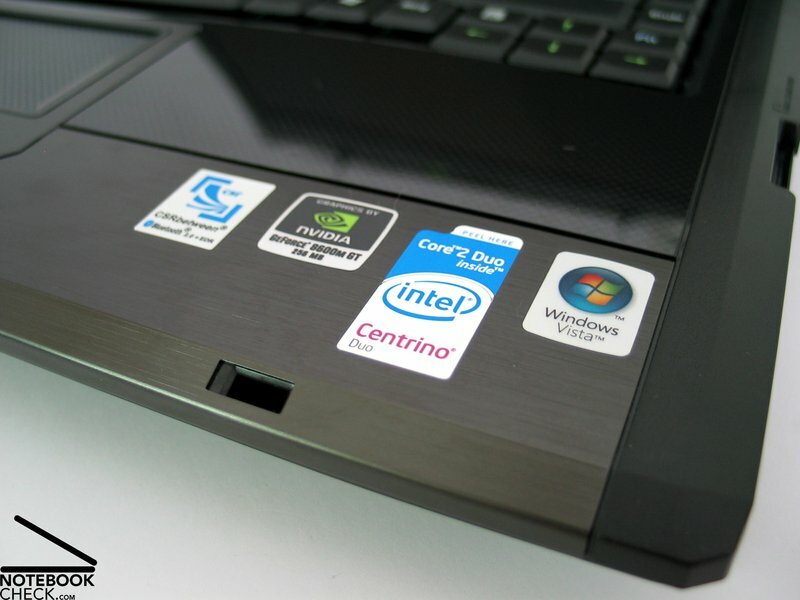 Furthermore, the Asus G1 comes with 2 pads providing additional keys. 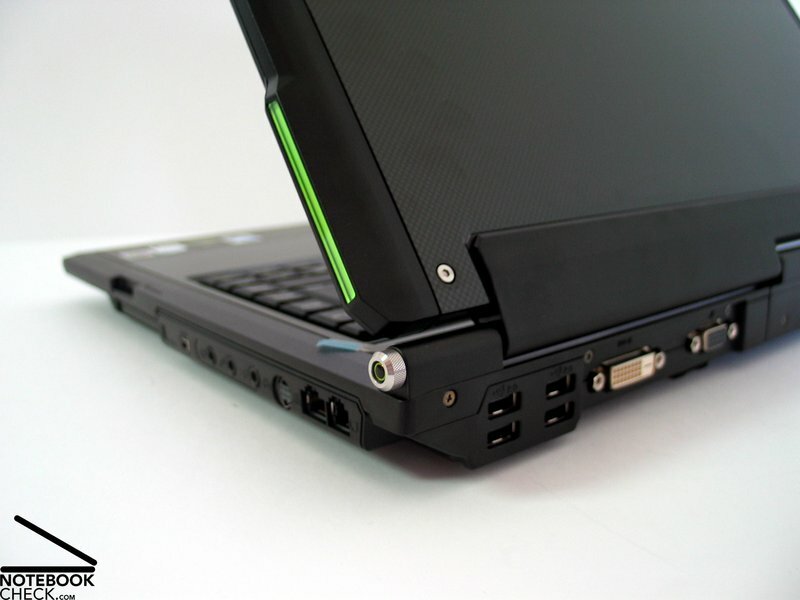 A row of keys is at the front side of the notebook and provides keys for controlling the media player. Another one is right above the keyboard and keeps keys for Asus typical functions, e.g., a mail and browser shortcut key and a key for controlling the performance- or energy settings. 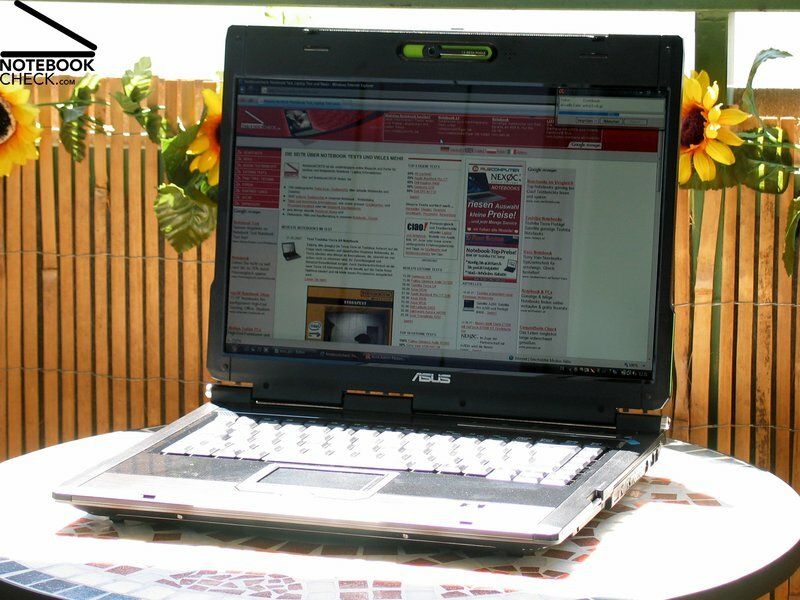 The first relevant difference of the Asus G1S is the provided display. 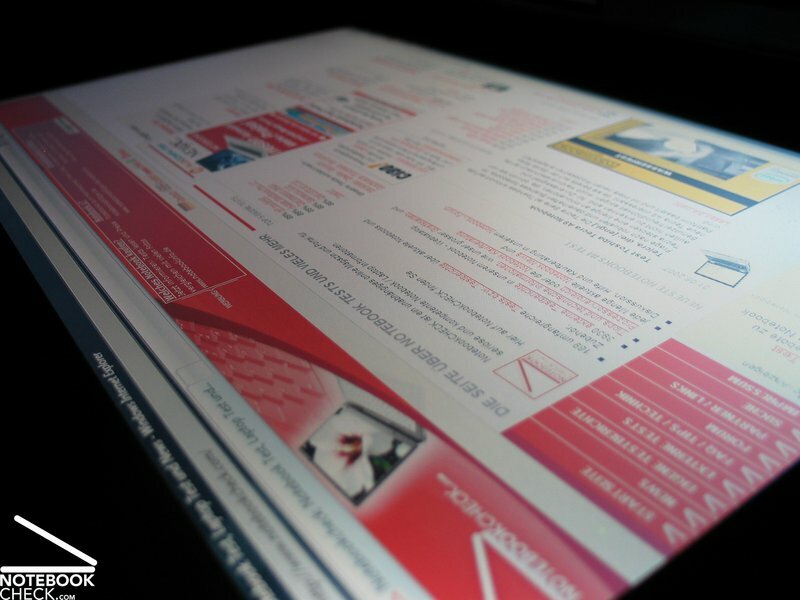 Instead of a 1280x800 standard display it is equipped with a 1440x900 WXGA+ panel. 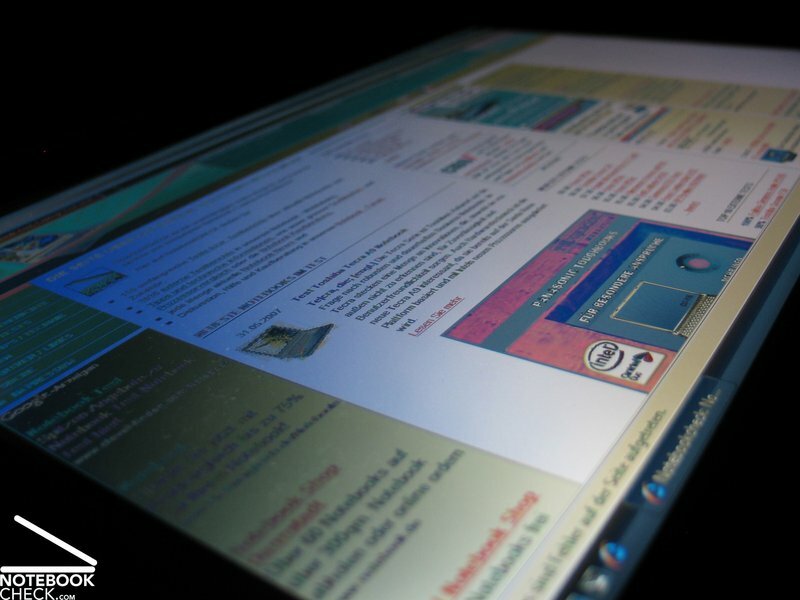 This increases the clarity and lets the Windows Vista desktop appear slimmer. The heavily reflecting surface was retained. During the test the panel reached a good maximum brightness of 195.0 cd/m² in the center of the bottom part. 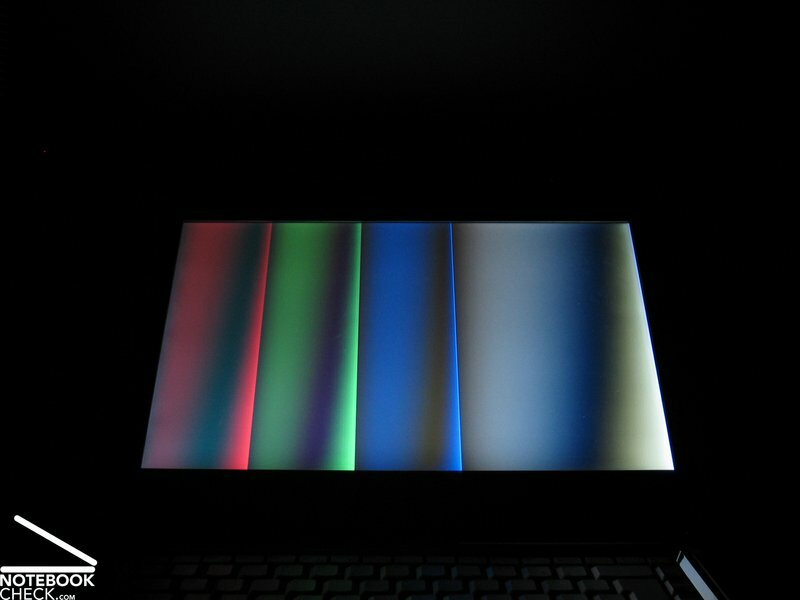 Also regarding average brightness this display is alright with 165.3 cd/m². The illumination is only 67.3%, because the brightness diminishes at the upper corners. However, subjectively this does not really impact the picture. 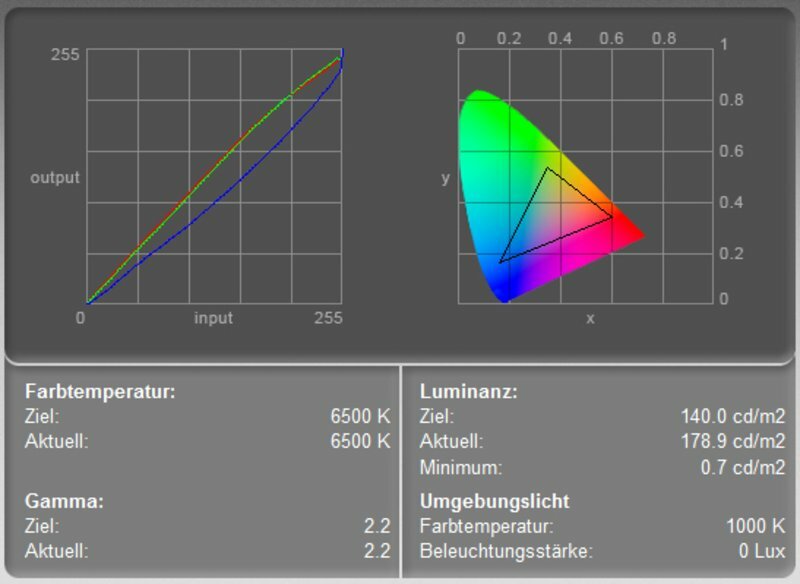 The measurement diagram depicts a clearly lowered blue color curve, which leds to colors appearing warmer. 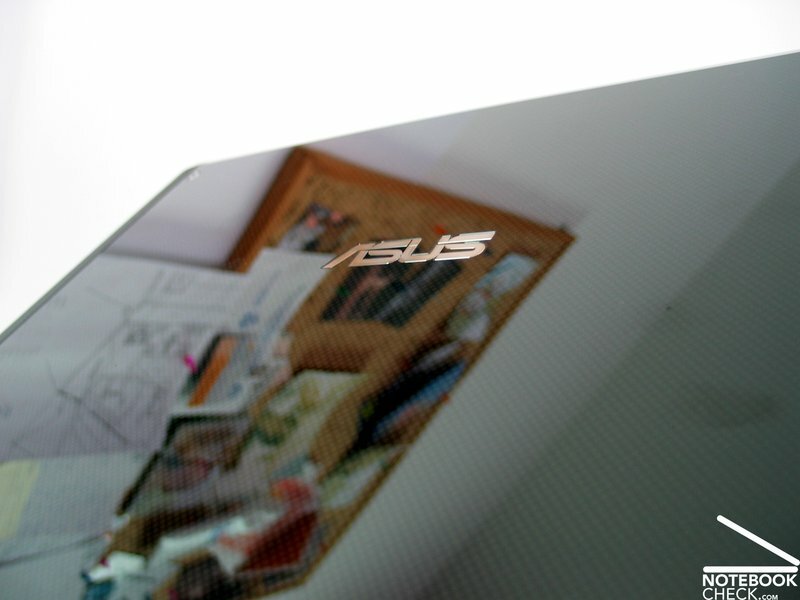 With a black value of 0.7 cd/m² the Asus G1S' display reaches a maximum contrast of 279:1, a good value. Also the display's speed of reaction tested by various scroll tests is alright. The display's good brightness supports outdoor usage. However, depending on the vantage point and the brightness of the environment, you'll face heavy reflection at the display surface. Regarding stability to the vantage point the area of operation is sufficient. 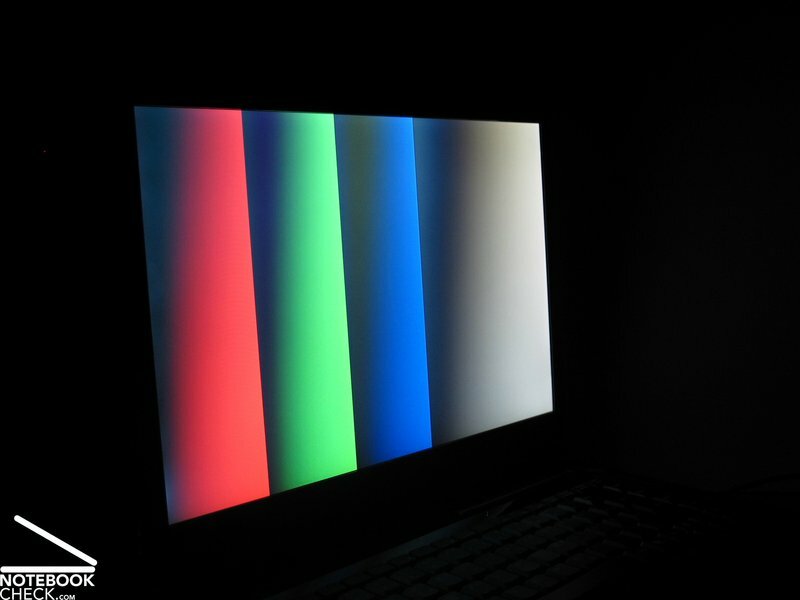 But, outside it, especially vertically, looking from bottom up the display clearly darkens and colors change. Horizontally, the maximum angles are basically limited by reflections. 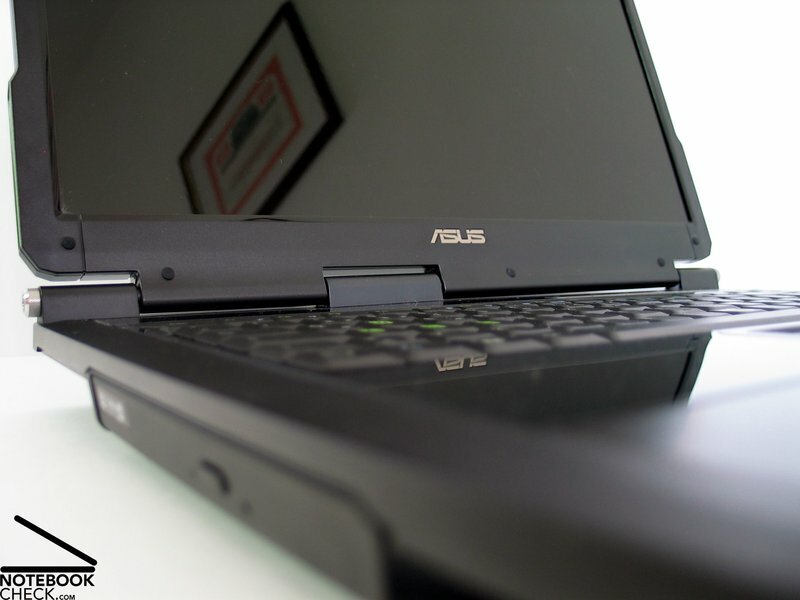 The only weakness we criticized at the Asus G1 with Intel 945 chipset was its moderate performance. 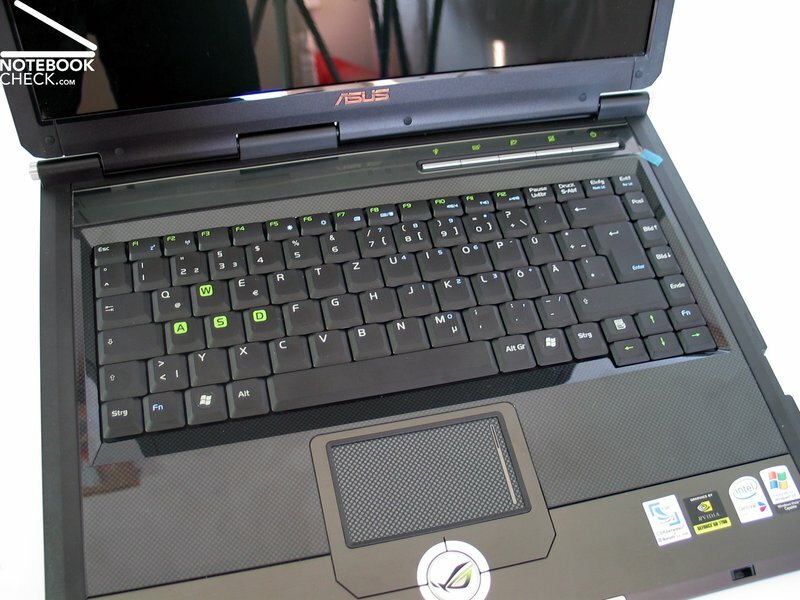 The new edition of this gaming notebook called G1S now utilizes Santa Rosa and some other new hardware components and so performance was clearly improved. 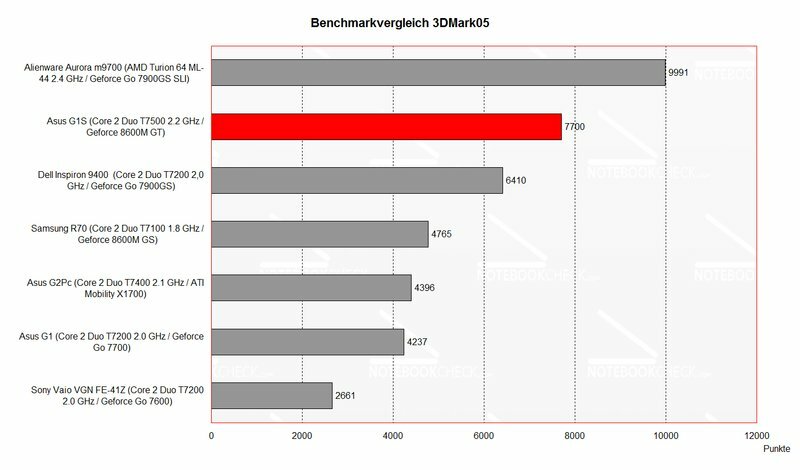 Mainly two components are responsible for the very good performance rating: First of all the T7500 CPU with 2.2GHz, secondly the powerful Geforce 8600M GT, which clearly outperforms the Geforce 7700 provided by the G1. The benchmark results clearly depict the performance increase. So, the Asus G1S is fit for current games. Native resolution: 1440x900, details: "ultra" - at 25-60 fps playable without problems. Resolution: 1024x768, details: "high" - Skirmish 1 vs 1 on a small map - 15-50 fps - well playable (sometimes flickering by zooming out). Resolution: 1440x900, high details well playable, sometimes flickering. So, the GeForce 8600M GT is well up to very well fit for current games. If you insist on absolute game fun without any flickering at highest resolutions, you should rather choose a notebook with a 8700M GT or wait until the 8800M series is launched at the end of summer. Choosing the performance profile "Quiet Office", somewhat helps limiting the G1S' noise. Although the fan runs all the time even in idle mode, its noise level of 34.3dB is still alright. Under load at maximum performance the fan speeds up and a maximum noise level of 49.4dB can be measured. However, this should still be alright for playing games. 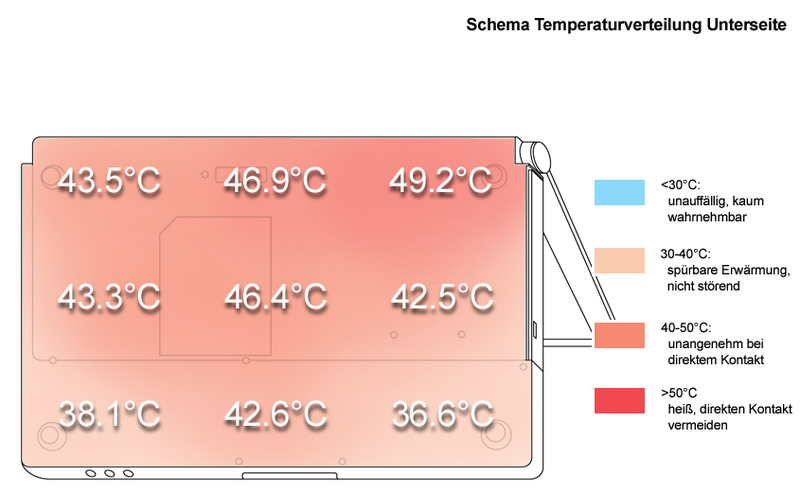 Although the G1S gets also at its top side clearly warmer, this has no impact on the use, because the hand ball support and the keyboard stay comparably cool. 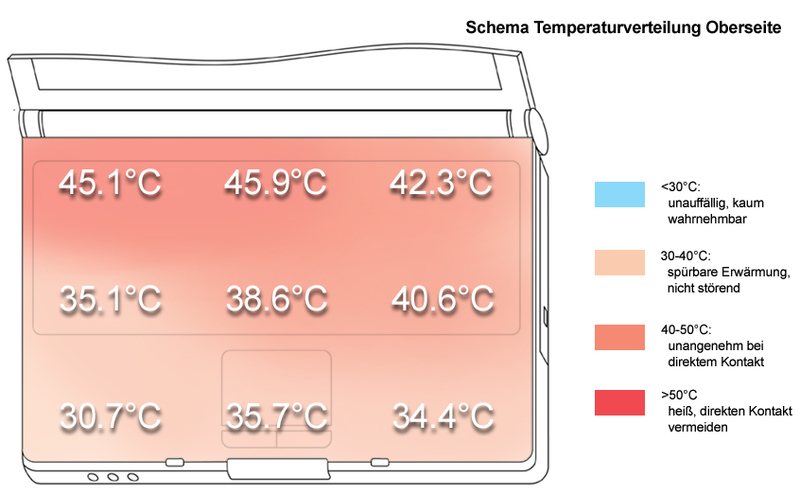 At the back edge the maximum surface temperature at the front side was 45.9°C and at the bottom side 49.2°C. At moderate volume the sound of the speakers, which are located below the left and right front corner, is alright. Maybe they sound a little dull. However, at maximum volume and at special frequencies they blast, which negatively impacts on the sound. The maximum volume is just sufficient. Because the G1S is alike its direct predecessor also equipped with 4800 mAh battery, a direct comparison is of special interest. Under load the G1S reached a runtime of 90 minutes. The maximum was about 3 hours. These are about the same values measured for the clearly weaker equipped G1. In total the battery runtime is rather moderate, but still allows a limited mobile use. The Santa Rosa update made a really mature gaming notebook out of the G1. Despite its design is still striking and needs getting used to, the complete package is successful. The keyboard seems sufficiently robust to stand even intensive gaming sessions and LAN parties. Also the provided Logitech MX518 mouse is alright for ambitious games. The 1440x900 WXGA+ panel scores especially by its high resolution. The brightness of the display is also alright. Only regarding the aspect stability to the vantage point it scores worse than the 1280x800 version. 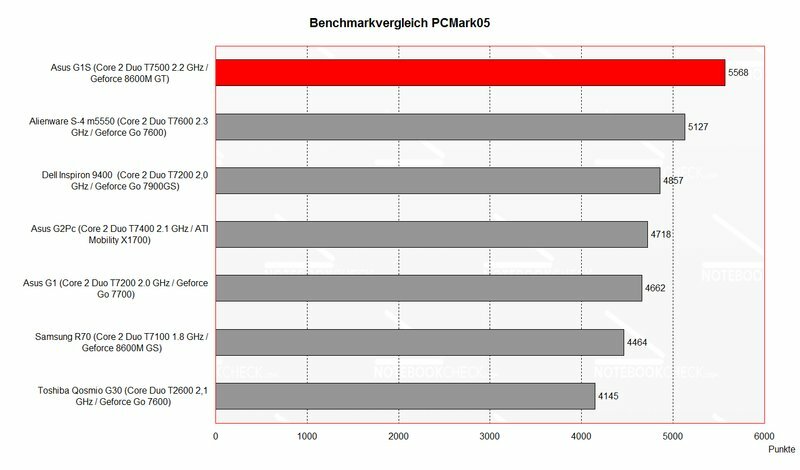 As already mentioned the Asus G1S hardware is basically interesting, because of the new Santa Rosa technology used, which stands for global performance increase. Another highlight is the Geforce 8600GT video card, which supports even brand-new games by DirectX 10 support. While the emissions are alright in idle mode, under load they are apparent. 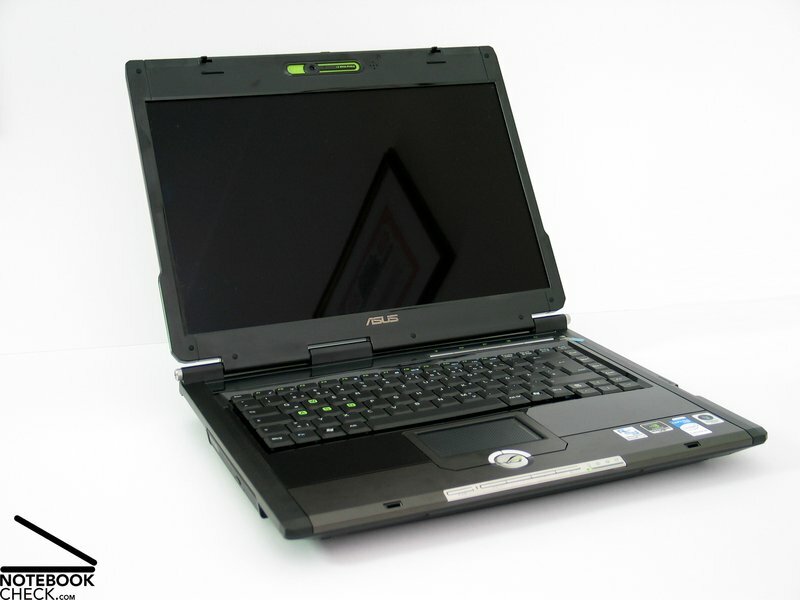 But, the tolerances regarding loudness and surface temperatures are generally higher when playing games, so the Asus G1S still scores passable regarding this aspect. 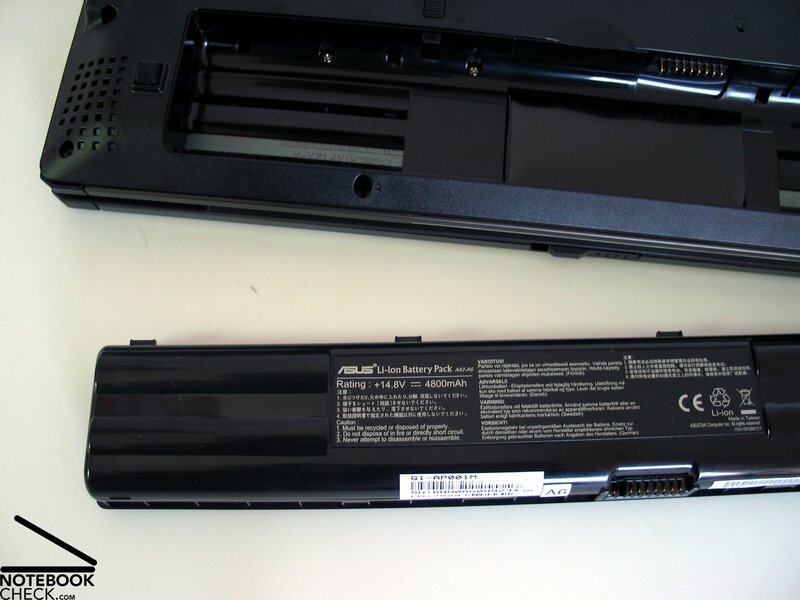 The battery runtime is between 1.5 and 3 hours, which is acceptable and even allows a limited mobile use. And the surface temperatures, especially at the bottom side are quite high. The G1S's fan can be heard nearly all the time. 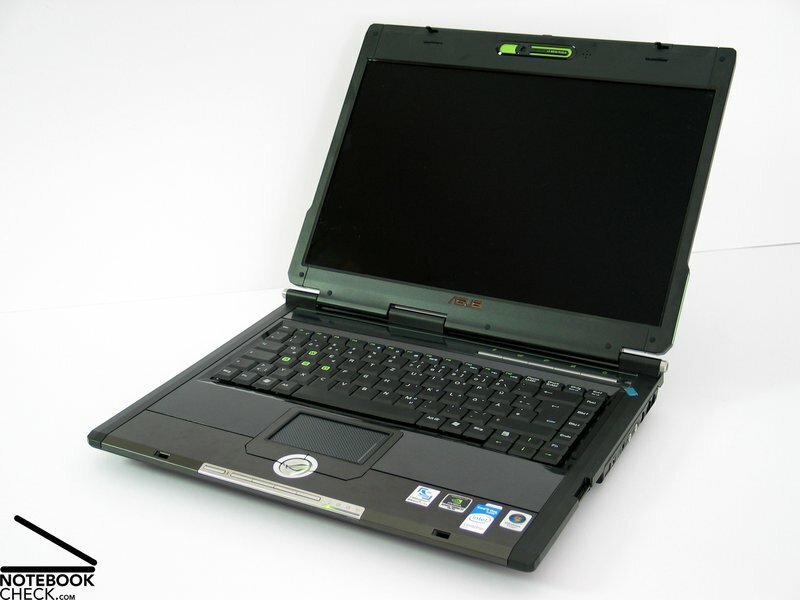 Core 2 Duo CPU T7500 and Geforce 8600 GT video card built-in the G1S. The vertical stability to the vantage point could be better too. 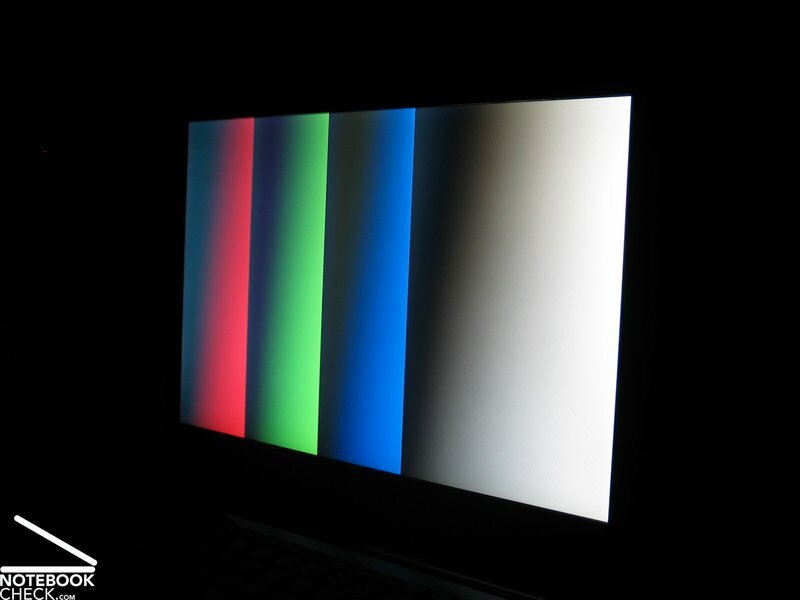 The brightness of the display is good, but the illumination below-average, and the display clearly reflects. Even the keys are styled to reflect the gaming character. Generally, the input devices are alright. Most of the interfaces are next to the right back corner. ...and a variety of different materials. ...or also a 1.3 Megapixels web cam. 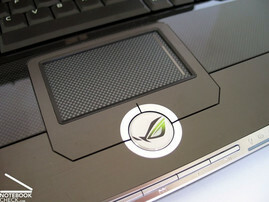 ...the trademark of the Asus G1S. By all means mobile: The 4800 mAh battery makes a limited mobile use of the G1S possible.